In today’s world of youth baseball, it’s not always easy getting shots of your grandson in action. High chainlink fences wrap around the playing fields wherever we go to watch him play. I surmised that there are practical reasons for that. They serve as barriers between the spectators and the playing field, where only the players, coaches, and umpires are permitted. The fences are an impediment to photographers who want to get the best shot possible of their children or grandchildren. In this case, I photographed my grandson batting. I used manual focus to blur the mesh fencing. When he hit a sharp liner to center, the ball skipped by the diving outfielder and rolled all the way to the outfield fence. 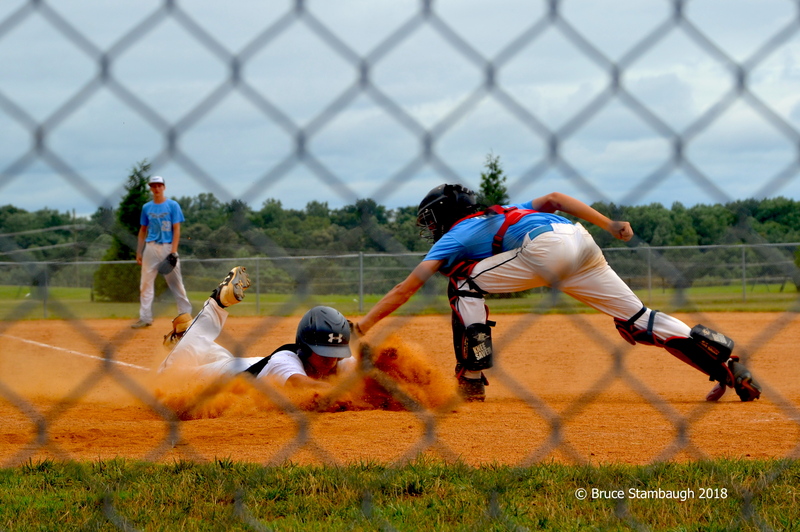 Our grandson raced around the bases and slid headfirst into home. The powdery red dirt ubiquitous in Virginia went flying. He was safe by a whisker for an inside the park home run. “Safe at Home!” is my Photo of the Week.